Good news Spotify users in the Philippines! 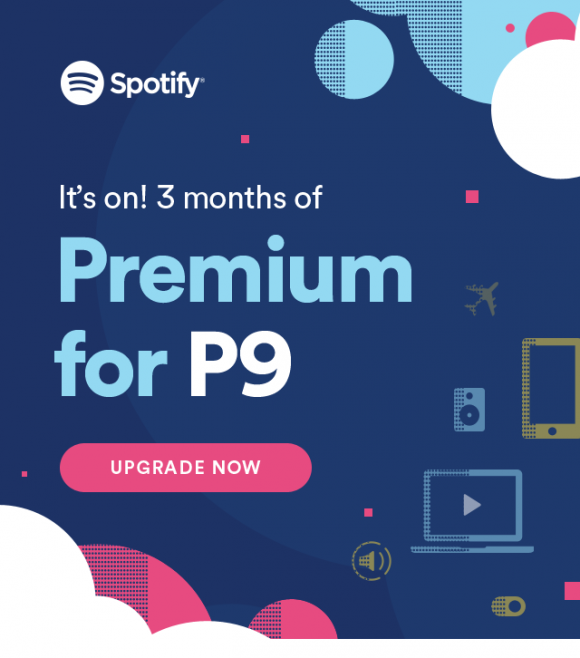 You can enjoy 3 months of premium Spotify usage for only P9.00. Listen to your favorite music without any ads. Download tracks and play them even without phone service. Play any song just by searching. Audio is played with 3x better high definition quality. You can avail of this offer until December 31, 2015. Visit https://www.spotify.com/ph/premium/ for more details. I tried the 7 days free premium and was actually waiting until before the promo ends (December 31) before upgrading (poor problems :) but I wanted to check if the issue below (see comments) does occur - changing the payment method will increase the pay to regular price. Also, my 7 days free is up so I just tried paying using a different method other than the default selected option and it worked (PayPal, although this is still connected to an eCredit card). What's best, the premium feature was applied right after I upgraded. However, people who are paying using other methods (not the default credit card) are unable to avail of the promo. For this reason, I suggest contacting Spotify for further details since this was not specified in the promo details page. Apparently, this only works when using credit/debit cards (including PayPal due to the automatic billing) and not for other methods as per the discussion of other users on Facebook here. Promo is not available for those who have already tried Premium. This works only for new accounts. How about current spotify premium subscribers? How can they avail themselves of the promo? This is what says under the Promo Title (if you open the Spotify link): Terms and conditions apply. Offer not available to users who already tried Premium. So it looks like it's only for those who don't have premium yet. I tried it when i was about to pay it says that i will be paying 129. Its so confusing. I used PayPal last night and it worked (although it's connected to an eCredit card - see post update). Best to contact Spotify to verify. The 9 pesos promo is available only for credit cards? I noticed that when i change the mode of payment it becomes 129.00. This is a trap!!! I have no idea. Someone attested to using Paypal though and it worked fine. Ugh! I don't get it. How can I avail premium for P9??? When I tap my screen it become 129! Spotify said the promo should be availed directly on the website. But when you go to their Web page it's still charging P129. I got charged P129 on my mobile for P9.00 promo! Spotify cares doesn't really care! I availed the P9 promo but was charged P129 on my mobile phone. Spotify cares who doesn't really care about their subscriber said that the promo is only valid if you subscribe via their website. When you go to their site and bout to pay it then shows as P129 for 3 mos. The promo is a hoax! Don't subscribe! Sadly, it only works when you pay via credit card or PayPal that's connected to a credit card. I have no idea. It doesn't say so on the promo details. I think ang nakalagay dun is after 3 months its your option to continue with 129... natry ko kahapon ung 9php working nmn but im wondering bakit parang 30 days lang xa :( or every month ang 9php :( den auto renew... nako nako! Mukhang marami ngang issues sa Spotify. I have no idea. You should contact their support. Misinformed about the ads.. it says P9 promo for 3 mos but then it is only available through credit card. Spotify team please do make your ads more specific. This is really inconvinient. If you're referring to Globe, yes, I've read several complaints na rin in forums. For one, the 499 Postpaid Plan supposedly comes with 3 months free for Spotify Premium but I didn't get any and I had to subscribe directly to Spotify. Nope. You're only charged exactly 9 pesos on your credit card. But if you don't turn off the automatic renewal, you'll be billed the regular rate (129 pesos) after 3 months. Hi? pano ako makaka-avail ng 9 pesos for 3 months? Hello! You have to a registered user to avail of the promo. Head over their website https://www.spotify.com/ph/ . The promo is showing right on the home page. You need a credit/debit card to register for the promo though. Other payment options are not included. Hi. I tried subscribing today (9php for 3 months) but im a bit confused because it directs me to a site where you have to subscribe with a family which cost php193.50. Any idea on how to get rid of if and pay only php9.00? I am subscribe currently to php129.00 a month. Do i have to stop d subscription before trying the php9.00 for 3 months? Hello! Sadly, the promo is only for new subscribers which have not availed of it before and have not subscribed to any plan yet. So unfortunately, you are no longer eligible for the promo. Hi pano yung sa mga naka pre-paid card like Metro bank? From what I read, credit/debit card works for the promo. Your prepaid card can be considered a debit card so it may work. Hi pano ung mga naka prepaidcard like Metro bank? What did you use for availing the 9 pesos for 3 months? Was it by credit card? Or pwede din po bang mobile account lang? Hi? Paano mag bayad sa Spotify using mobile load? Smart kasi AKO e.
Follow the payment process. May option dun for mobile load payment. Some of the comments here though said that it doesn't work for this promo. Nag avail ako at lumabas na siya sa email ko pero ang pinili kong pagbayad sa mga SM Supermalls. Di pa din activate yung akin, pano yun? Magbabayad muna ako para ma activate siya kase nagsend na ng ref number? TIA! Siguro nga you need to pay first. Try contacting Spotify for details. In availing for the Spotify 9 pesos for 3 months premium, does it have to be paid through credit card or pwede po ba through mobile account lang? There should be an option for other payment options on the drop down although based on comments here, only debit/credit cards are accepted. Hello! Thanks for sharing this. It will really help those who have been asking that question. Paanong hindi gumagana? How did you buy? From the website ba or the app? The app should be linked to the website account. Baka kasi magkaiba ginamit mo to sign in sa app and then sa website. Can you use prepaid load to upgrade to a premium account? I believe there's an option to do so for Globe. Do follow the Premium upgrade page and see what payment options are available. Recently lang ba? Dati kasi ayaw daw. I'll update the post after you confirm. Others should know na kailangan muna nilang i-download yung kanta before ma-play offline. Baka kasi yun yung nagiging problema nila. Tama. It also takes the phone memory's space when you download the song for offline streaming. All tracks downloaded will also no longer be available for offline streaming once the premium subscription expires and there is a need to re-download again once the subscription is renewed.